Fact: A LinkedIn profile is a fundamental element of a strong online presence. But, did you know that, according to LinkedIn, you are actually 40 times more likely to appear in a search if your profile is complete? That’s important stuff! Think of your profile as your online resume, but with so much more! 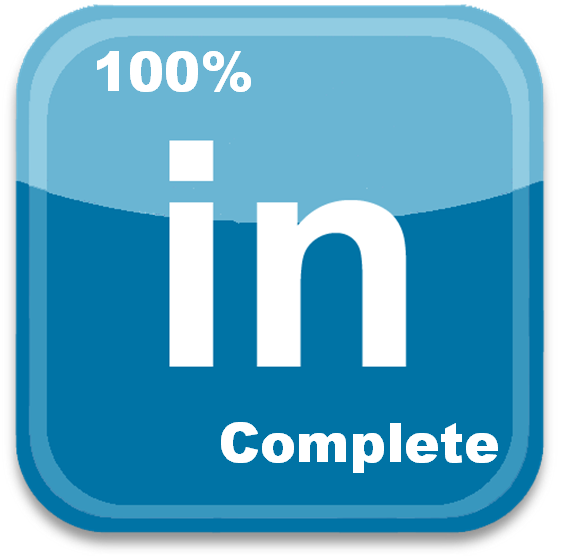 Here’s how you can bring your LinkedIn profile to 100% completeness to improve your search engine optimization. If you don’t happen to be currently employed, it’s not a good idea to blatantly lie, but an idea might be to state that you do some consulting – that you’re self-employed. Or, if you do any volunteer work, here would be a good place to showcase that. Likewise, if you’re new to the working world and don’t have two previous jobs under your belt, again, be creative – what have you done in the past that might constitute ‘a previous job’? – Your Educational Background – You want people with whom you’ve gone to school to be able to find you on LinkedIn. Even if you’re not a university grad, ensure that you include any and all education that you do have. It’s not practical to lie and include a degree that you have not earned. Just make sure that you include any courses that you have taken. – Your Profile Summary – This can be up 2000 characters, and although it’s not necessarily recommended that you use all 2000, it’s essential for you to use at least 100 characters. In filling out the Summary portion, remember to include all of the crucial, need-to-know information about yourself. Keywords are important here as brevity is essential! Consider your summary your “Elevator Pitch” – you have less than one minute to share all the vital information you want people to know about you. Ensure that it captures the essence of the ‘business you’ and that it specifically lets connections know exactly what it is that you can do for them. Make it quick, but make it count! – Your Specialties & Skills – Fill these items in as you would search terms or keywords. Consider the position and mindset of a person searching for your skills or services. What words would they use? – Your Photo – This is important, as it is the means by which you are most easily identified. There could be more than one person out there that shares your name! Consider having a headshot done professionally – you want to put your ‘best face’ forward and you want to ensure that the photo is well lit and really does look like the professional you. It’s also a good idea to use the same photo on all of your social networking profiles as your photo can be your brand identity. – Your Recommendations – A minimum of 3 recommendations are required to post a complete profile (each is worth 5% on the completeness scale). It is possible to solicit recommendations from colleagues, former employers, and people you have hired. It is in fact a good idea to have at least one recommendation from each of your jobs. It is within the culture of LinkedIn to request recommendations from others. A good idea is to reciprocate and write one for someone from whom you want to request one. It’s also a smart idea to provide the links to your website, Twitter account and blog where applicable. This enhances your online connectedness as well as your SEO (Search Engine Optimization). It’s imperative that your profile’s searchability be at its maximum potential. Your profile should be searchable on all search engines as well as on LinkedIn. To the right of your profile page, a narrow blue box appears that indicates you profile completeness – try to bring it to 100%. It could make all the difference! This entry was posted in LinkedIn, Real Estate, Social Networking, Traffic and tagged linkedIn, LinkedIn Profile Completeness, real estate, Real Estate Professionals, Search Engine Optimization, SEO. Bookmark the permalink.